Visit White Sands Beach Resort, located on the Beautiful Beaches of Anna Maria Island, famous for White Sandy Beaches and Crystal Clear Water. White Sands is a True Florida Vacation Get-a-way! Tripadvisor Ranked Anna Maria Island, Florida 4th in U.S. Island Vacation Destinations! White Sands offers charming one & two bedroom Florida island style apartments, studios, cottages & motel rooms. More than just a motel hotel, All rooms have fully equipped kitchens, have 42 inch LCD TV's , playstation2 and DVD/VCR at our Florida beach resort. 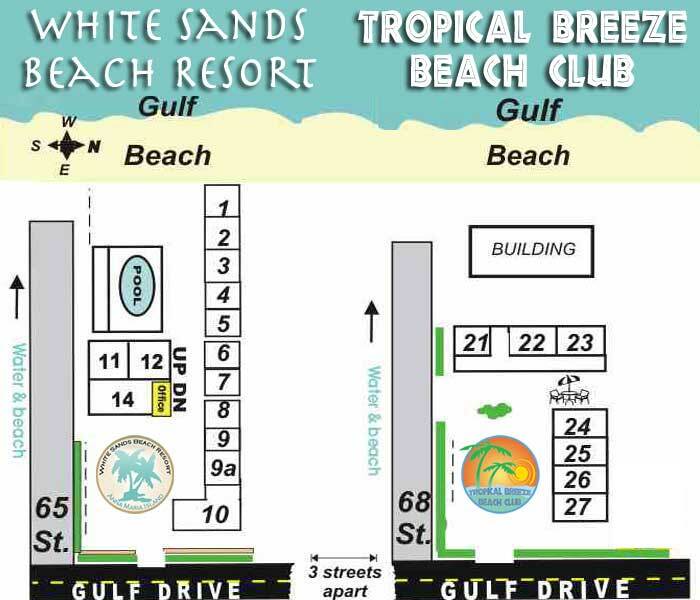 While on vacation at the White Sands you can enjoy a gulf front heated pool, shuffleboard court, picnic areas and bar-b-q grills. Nearby are tennis courts, island beach shops, golf courses & a number of award winning restaurants like Beach Bistro and Sand Bar. We have Twenty-one Florida resort units on the gulf with kitchen and phone, & heated pool on the beach. No pets. Our island resort is located on the west coast of Florida just south of Tampa and is a great island vacation place for family vacations and Honeymoon vacations. All Reservations online must Arrive on a Saturday and Depart on a Thu., Fri., or Sat..